We are excited to announce this year’s 2014 Black Friday and Cyber Monday HUGE SALE and FREE giveaway event. 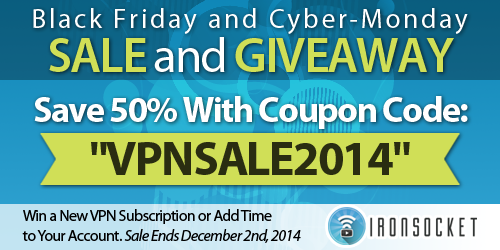 Starting this November 26th we are offering a 50% savings coupon on all new subscriptions. On top of this amazing discount, we are giving away 3 FREE Yearly and 5 FREE 6-month IronSocket subscriptions. Existing users may receive subscription time extensions if they desire. This sales event ends on December 2nd, so don’t wait! Winners will be selected at random at the end of the event and will be contacted via Twitter or FB. If no response is received within 5 days another winner will be randomly selected. 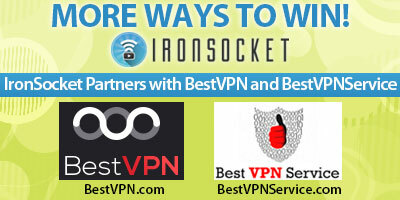 In addition to the sales event described above, IronSocket has also teamed up with BestVPN and BestVPNService – two of the best VPN reviewers in the industry – giving you more chances to win! We wish the best of luck to everyone, and to have a great Black Friday and Cyber Monday from The IronSocket Team!